HUG a tree. Recycle your newspapers, magazines, milk cartons and boxes. Read your information on screen rather than printing. And now you can drive to work with a little less guilt. 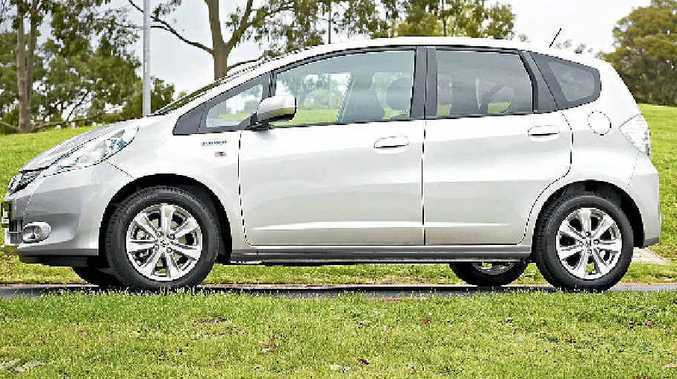 Honda has released the most affordable hybrid vehicle in Australia, equipping its loveable little Jazz hatch with petrol-electric power. For just under $23 grand the Jazz offers thrifty fuel economy in a well-finished and likeable package. But the hybrid variant is not the "greenest" of the Jazz family. According to the Federal Government's Green Vehicle Guide, the Hybrid is trumped by its GLi sibling. The Hybrid has 4.5 stars (with the lowest CO2 emissions) but its air pollution rating of 6.5 out of 10 drags its score down - the GLi with a manual transmission has five stars and scores 8.5 out of 10 on the same scale (because it is rated "Beyond Euro 6" vehicle). Yet it's still the most fuel efficient of all Jazzes, and best of all, it doesn't look gawky and shout its environmentally friendly credentials. With little change in the cabin, the styling is not quite as futuristic as we've seen in Honda's Civic or the sleek coupe hybrid CR-Z, but everything looks upmarket despite a hefty use of plastics. The layout is simplistic and easy to operate, with the various buttons and dials well positioned. Bluetooth phone connectivity is available, not through the stereo but an A-pillar mounted device. All the main functions are at your thumb- tips, like cruise control and audio, courtesy of the multifunction steering wheel. Comfy pews offer reasonable support and the hardy trim could cope with the rigours of family life. Head and leg room is excellent for a small car and four adults can be accommodated. Five can be done but that's best left to short journeys. There is a constant reminder of your driving habits in "Eco" mode. Press the button on the dash and it engages an "eco-coaching" system that inspires the pilot to drive economically. Cruise around with judicious use of the right pedal and the speedometer is surrounded by soothing green. Ask for more effort and it morphs into aqua, before turning blue when the Jazz is at its least efficient. With some extra weight over your standard Jazz, the Hybrid doesn't have the same zesty feel. Reaching the summit of steep inclines can take some encouragement, as does darting into an opening in traffic, and heavy use of the accelerator is partnered with a reasonable amount of engine noise above 3000rpm. Push too hard into a corner and the low-rolling resistance rubber will squeal quickly as the Jazz scrubs wide - but you do have to be pushing its limits. In most conditions the Jazz cruises quietly and effortlessly, with timely responses from the continuously variable automatic transmission. The Honda has one of the more unique hybrid systems we've used, and the automatic stop-start functionality was quick to operate - often shutting down the engine when coasting to a stop. Honda says the electric motor can drive the car without petrol but we never experienced this in our week-long test. Rear parking sensors and metallic paint are the only key features on the options list. Complimentary items include climate controlled air-con, electric windows, cruise control, CD stereo with iPod compatibility and USB connectivity, Bluetooth phone connectivity and a comprehensive trip computer. Safety includes six airbags, stability and traction control systems, along with anti-lock brakes with brake assist. The closest in price for another hybrid is Toyota Prius C (from $23,990), but those looking purely at fuel economy could look at the Mini Cooper D (from $34,800), Fiat 500 (from $18,800), Volkswagen Polo (from $16,990) or the bargain- basement Suzuki Alto (from $11,790). We achieved fuel economy figures of about five litres for every 100km, which was slightly above the official figure of 4.5. Insurance should be at the cheaper end the scale, servicing prices can vary between dealerships so it's worth investigating first. Fear not caffeine lovers, seldom would you struggle to find a spot for your brew. The Jazz has 10 cup holders. Storage spots are good, with plenty of nooks for your vital stuff like phones, keys and MP3 players, while there are door pockets up front. The trump-card of the Jazz has always been its seating flexibility, with the rear seats dropping flat to create a space good enough to embarrass many SUVs. But the Hybrid battery eats into the space, and this variant loses more than 100 litres of boot space compared to its sibling. The rear seats still drop flat, but it's not as good as we are accustomed in the Jazz, plus there is only a space saver rather than a full-size spare. Child seat anchorage points also tether to the roof, which can impede rearward vision and load space. The "chrome blue" grille and headlight surrounds, clear LED taillights and a silver tailgate strip are the only design cues of the differing technology within. Inoffensive and practical in its design, the Jazz Hybrid doesn't look like a hybrid or an out-and-out greenie. The good stuff: Functional cabin, easy to drive and great in car parks, addictive economy coaching system. What we'd like to see: Even better fuel economy, boot space the same as normal Jazz, Bluetooth audio streaming. Warranty and servicing: Three-year 100,000km warranty, battery has an eight-year warranty. Servicing is every six months or 10,000km. Principles of the Jazz Hybrid make sense, but unfortunately the cents don't stack up. Those buying on fuel economy alone would be better served by the entry-level Jazz which is $8000 cheaper - but doesn't have all the extra features. Yet there is a lot to like about this green Jazz. The little Honda remains easy to drive and ultra nimble in car parks, making it a great around town accomplice. Details: Five-door compact front-wheel drive hatchback. Engine: 1.3-litre four-cylinder petrol with Integrated Motor Assist (IMA) together generate maximum power of 72kW @ 5800rpm and peak torque of 167Nm @ 1000-1700rpm. Bottom line: $22,990 (plus on-roads).